What a difference a day – or two – makes. With his shocking 7-6(6), 6-1, 3-6, 7-6(5) victory over Novak Djokovic, Querrey has rewritten his rep and perhaps changed the arc of his career, all the while altering tennis history – crushing Djokovic’s hopes of a calendar-year Grand Slam, snapping his win streak of four successive Slams and 30 Slam matches, and dealing the Serb his first pre-quarterfinal Slam loss since the 2009 French Open. At the beginning of Saturday’s play, Djokovic raced to a 4-0 lead in the third. The first of today’s rain delays only seemed an opportunity for Querrey to mull over past chokes and a rapidly vanishing lead. But Querrey broke Djokovic once before the world No. 1 claimed the third set, and the battle resumed in earnest in the fourth. 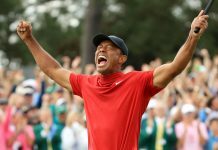 The stop-start momentum of sun and rain extended to the court as both players repeatedly fought off break points, Querrey with thunderbolt serves, Djokovic with a steady resolve – if not quite his usual peerless precision. It took Djokovic a dozen break points to gain a 5-4 advantage. A replay of the Serb’s come-from-behind victory against Kevin Anderson at Wimbledon last year began to appear likely. Yet Djokovic appeared to be arming his serve, which lacked its usual speed and pinpoint placement. Querrey broke back and came within a game of victory when the skies opened up yet again. It was time to note a coincidence: over on Court 18, Querrey’s fellow American Steve Johnson – fresh from a grass title in Nottingham and with seven wins in a row to his name – was also a game away from victory in the fourth set, albeit more assuredly, leading Grigor Dimitrov 5-2. In fact, both matches had lasted the exact same amount of time: two hours, 47 minutes. Could a new, happier day in American men’s tennis be arriving? The answer was a resounding yes. Johnson struck first, notching a (6)6-7, 7-6(3), 6-4, 6-2 win over his Bulgarian foe. But all eyes were on Court 1, the same court that gave Djokovic trouble against Anderson last year, where the world No. 1 held serve but then sent a series of backhands into the net and one final forehand wide to give the current world No. 41 by far the biggest victory of his career. 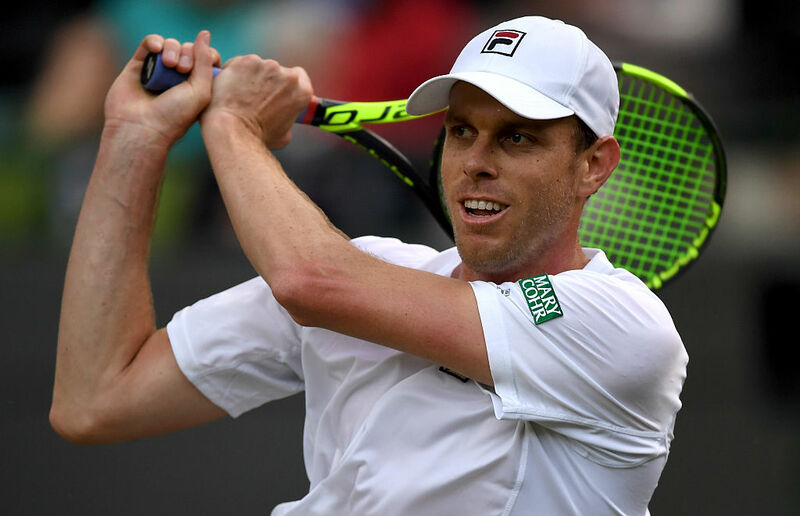 “It’s incredible, especially to do it here at Wimbledon – I’m so happy and ecstatic,” Querrey said after sealing what’s already been called “Djexit,” adding, “I’m just going to take it one round at a time. I’m not even sure who I play next.” His coach Craig Boynton had some memorable words for the press: “Sometimes a blind squirrel finds a nut,” he said. MADISON’S AVENUE: Also on Court 1, Madison Keys followed up Querrey’s jaw-dropping victory with a more routine win of her own, albeit over Serena’s frequent bugaboo, French drama queen Alize Cornet. Now into the fourth round, Madison next faces No. 5 seed Simona Halep. With Jack Sock and John Isner still out on court, Americans were 4-0 in singles for the day – Sloane Stephens fought off a match point to squeak out a 3-6, 7-6(6), 8-6 second-round win over Mandy Minella. TEEN LOVE: Taylor Fritz’s announcement that he and his girlfriend were getting engaged drew attention. The duo are 18. 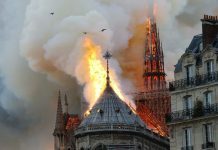 Fritz conceded, “It’s a big step.” But he added, “We have already been traveling the world together for almost three years, so she’s pretty much part of the team at this point. I’m really happy for everything.” Taylor said his goal was to break into the top 50 by the end of the year. MOTHER AND SON DEBUTS: Former pro Kathy May first walked out at Wimbledon and played Billie Jean King. Her son’s debut was against Stan Wawrinka. Both were 18 and both lost. At least Taylor won a set. FINE AND NOT MELLOW: Heather Watson was fined $12,000 and Serena Williams $10,000 for racket abuse, while Victor Troicki was fined $10,000 for what seemed like a much larger outburst. Unsurprisingly, volatile Nick Kyrgios has also been hit with a $6,500 fee.